Along with half of his party’s MPs, Michaloliakos has been in custody since late September 2013, pending trial for forming and running a criminal organisation. His arrest followed a crackdown on the neo-Nazi party triggered by the murder of left-wing rapper Pavlos Fyssas by a party member. The prosecution of its leadership and the reduced media exposure, however, have barely dented the party’s support. 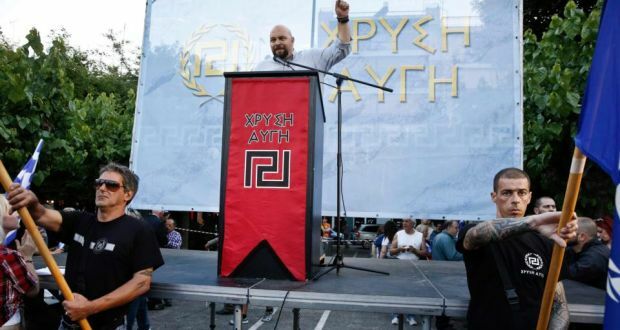 “If you consider that the right-wing element that votes Golden Dawn is already prone to conspiracy theories and the belief that Greece is surrounded by enemies, it is very easy for them to view the prosecution as politically motivated,” says Psarras, who believes the evidence against the Golden Dawn leadership is more than enough to convict them.“Golden Dawn’s violent activities were directed by a core of a few hundred members, organised like a militia. So when the ‘leader’ and the hierarchy were jailed, there was a dramatic decrease in night-time attacks and assaults on migrants,” he says, underlining that this demonstrates the importance of treating the party as a criminal organisation.